If you’re not happy with your current bathroom, usually, the best idea is to get a remodel. If done well, a remodel can completely change the appearance of the bathroom, which could even add value to the property. However, remodels are also quite costly. A complete remodel can cost upwards of ten thousand dollars. Unless you’ve been preparing for the project for a few months, not many people can afford that kind of budget. A beautiful backsplash is a prerequisite for a great bathroom appearance. But, a modern splash can set you back hundreds of dollars, right? Not necessarily. With less than a hundred dollars, you can purchase a modern-looking peel-to-stick backsplash. What’s better, you don’t need a professional to help you install it. Simply get a heat and humidity resistant peel-and-stick tile, remove the peel, and stick it on a clean, dry surface. To remove the tile, heat it with a hairdryer. You can never go wrong with a touch of brass in the bathroom. Well, copper also works, but brass is your best option. Most bathrooms are finished in chrome which is not only pale but also looks cheap. Brass instantly gives the bathroom that modern and expensive look. Of course, you don’t have to replace everything. A new soap dish, a little jar, and the faucets would be just enough. Geometric tiles are a statement-making addition that can instantly modernize any bathroom floor. However, the tiles can be pretty pricey, with each costing as much as $10, before paying your plumber Toronto. It means that by the time the tiles are installed, you could have spent close to or slightly above a thousand dollars. So, what do you if you can’t afford that? Simple – fake it! Instead of installing the real tiles, conceal the old bathroom floor using a cut to fit vinyl cloth. 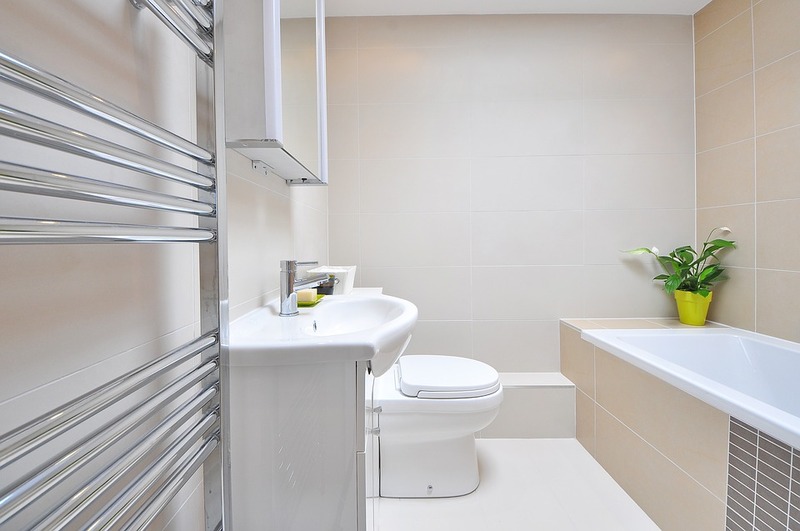 One of the reasons a bathroom may begin to look grim is dated walls. Perhaps you’re tired of the colors, or the paint might have started coming out, further worsening a bad situation. A simple (and cheap) solution to this problem is installing a removable wallpaper. You have two options. First, you can go bold and install a bright colored wallpaper to cover every bit of the wall. Alternatively, choose a patterned wallpaper that ties your bathroom together. Finally, nothing brightens up a dreary bathroom than the sight of plants. Plants have a natural tendency to beautify spaces by adding pops of color. Additionally, they freshen up stale air and lift wilted spirits. You need to understand, however, that not all plants can survive the bathroom environment. Ideally, you should go for plants that thrive in humid, warm environments. A few good options include the spider plant, aspidistra, and mother-in-law’s tongue. If you can introduce all these five additions to your bathroom, you’ll more than likely have a brand new bathroom by the end of it all.